Indulge in this naughty summer treat. 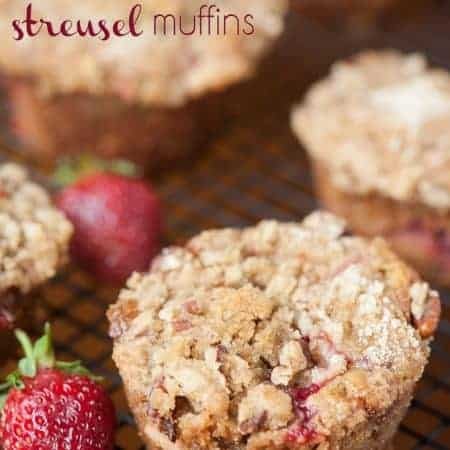 Strawberry Rhubarb Streusel Muffins are made with fresh strawberries and tart rhubarb wrapped in a brown sugar batter. 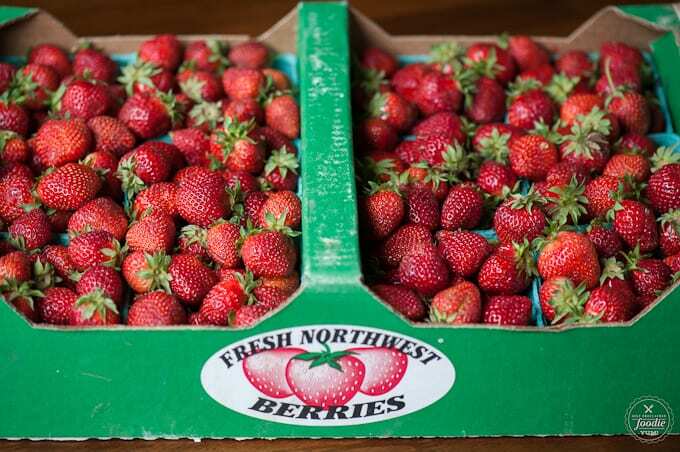 Last weekend I splurged on an entire flat of Oregon grown Hood strawberries – aka the best strawberry known to man. They’re small but deep red, juicy, and sweet all the way through. This type of strawberry isn’t really ideal for cooking – it is best for eating fresh or for making jam, but I couldn’t help myself. 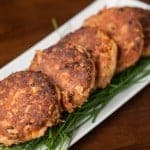 You will be overwhelmed with strawberry recipes. I also picked up this humongous gorgeous rhubarb. I asked the girl if it needs to be a certain size to be good (because these were huge) and she said they just needed to be red. Red these were. The muffin batter is pure naughty made with butter and brown sugar. Don’t fool yourself into thinking that because these are muffins, they’re healthy. They are far from my bran flake muffins that actually have a few healthy things going for them. Well, feel free to do what I do and use any rational or justification needed to satisfy your cravings, but they really are far from healthy. Especially once you add that struesel topping. YUMMMMMM…. These muffins didn’t rise up super tall and beautiful like my banana walnut or blueberry muffins do. I’m guessing because of how wet the strawberries were and because I tweaked the recipe around a bit. But boy, were they delicious. Love Strawberry + Rhubarb? Watch the recipe video below of How to Make Strawberry Rhubarb Jam! Preheat your oven to 350 degrees. 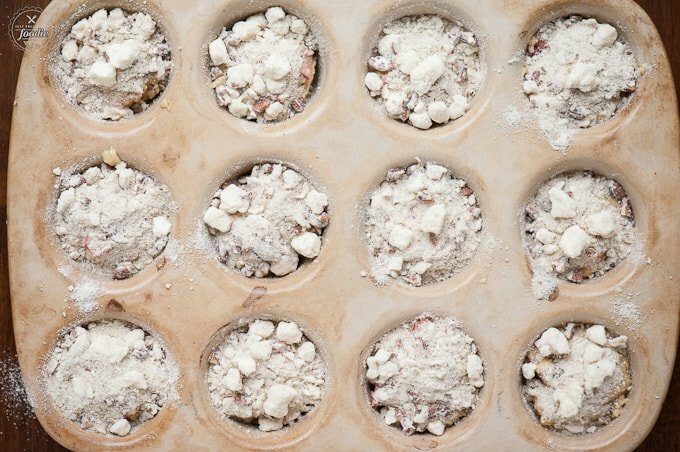 Line a muffin tin with 12 muffin liners or grease with butter. To make the muffins, combine the buttermilk, melted butter and egg in large bowl. Mix well. Stir in strawberry and rhubarb. 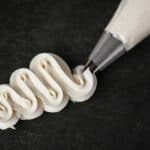 In a separate bowl whisk together the flour, brown sugar, baking soda and salt. Mix with wet ingredients and stir to combine. Do not over mix. Batter will be thick. 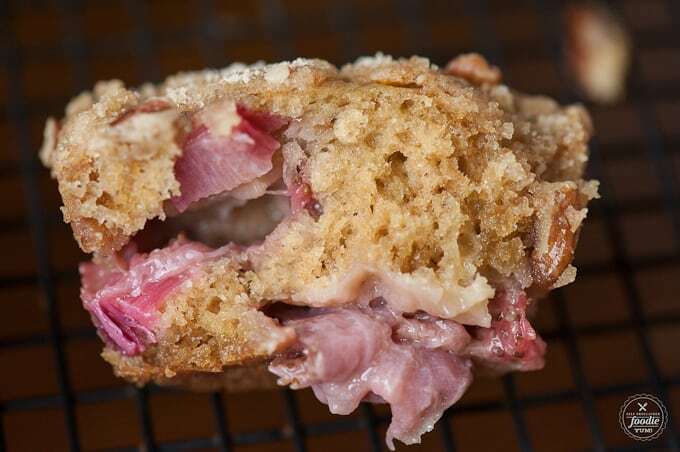 To make the streusel, combine the pecans, sugar, flour, cinnamon and butter, and mix until butter becomes crumbly. Store topping in bowl in freezer until ready to use. Scoop batter to fill each well about 2/3 of the way full and then top with a spoonful of streusel mixture. Makes 12 muffins. Serving size = 1 muffin. 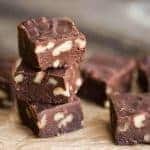 Would like to try this recipe but don’t know what 1/2 cube of butter is. Our comes in a solid package. 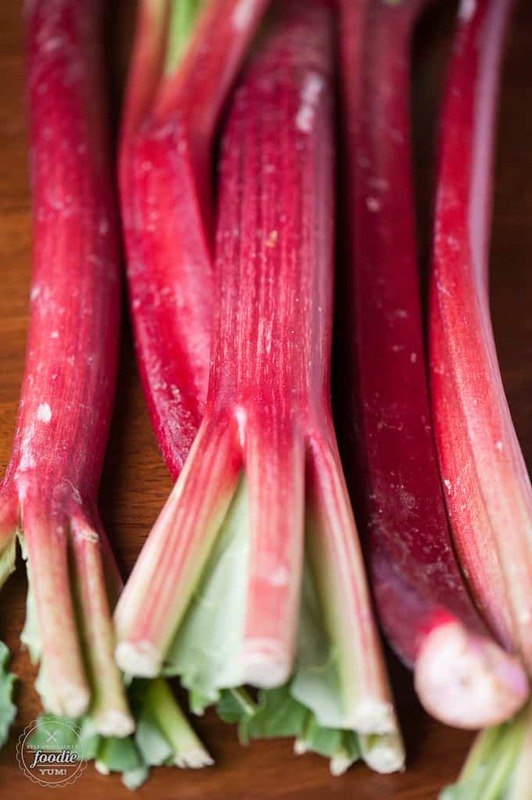 Always looking for new rhubarb recipes. Just stumbled across this recipe as I’m trying to use up rhubarb from the garden. 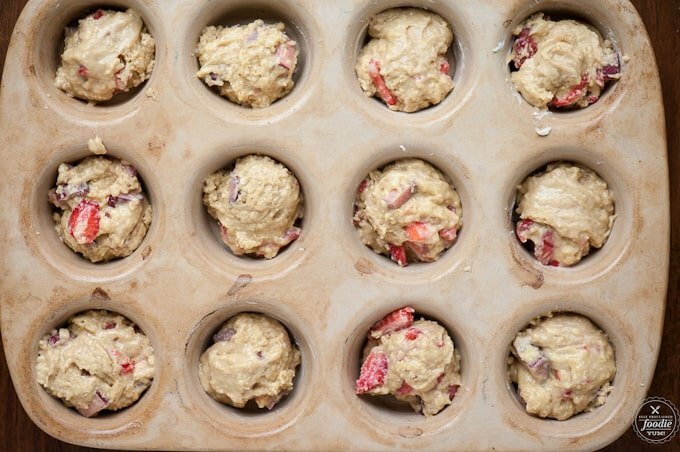 How much butter should be in the muffin batter? It’s listed as “¼ half a cube of butter”… is that ⅛ of a stick of butter? Doh! Sorry about that. Fixed! 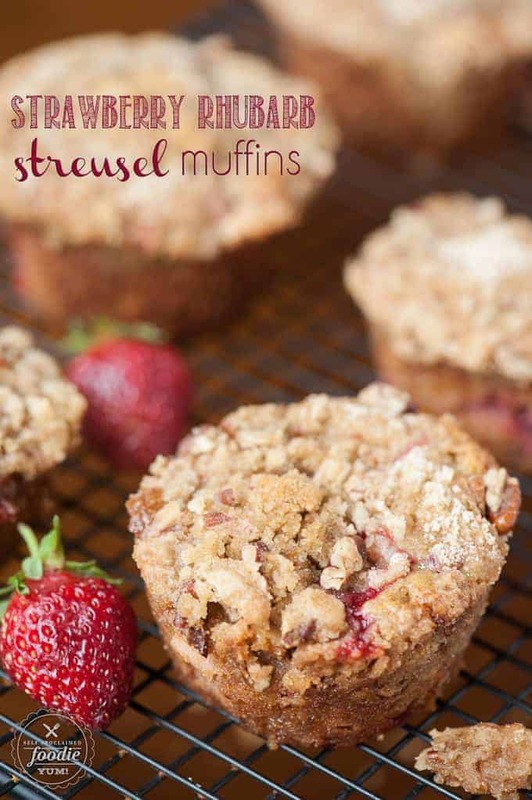 Should the streusel have flour in it. I tried making these, but trying to get the mixture crumbly wasn’t working. I decided to add some flour. I still didn’t get enough in it. My muffins are a hot mess. I put cupcake liners in the pan, the butter from the topping is all melted and has soaked the liners and left little puddles of butter in the muffin tins. Oh dear. Now I feel like a hot mess! It’s been awhile since I’ve made these muffins but I can’t imagine not having the flour in the topping either. 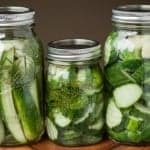 I’m gonna go back and add it to the recipe. I’m so sorry!!! Yep! Just make sure they’re fully cooled before you freeze them. I like to wrap them tightly to keep the air out.